Following the Oscar-winning success of Rebecca, Hollywood snapped up Daphne du Maurier's tale of an aristocratic woman who leaves her husband, goes to Cornwall and falls for a French pirate. 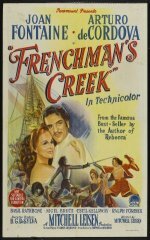 Mitchell Leisen's direction typically concentrates on the colour scheme, the sets and costumes, he was once an art director, while the story rolls along by itself. Joan Fontaine, the star of Rebecca, is ideally cast as the imperious woman in the throes of passion but she's handicapped by the dullest of leading men, Leisen had wanted Ray Milland, but got Ralph Forbes as the spineless husband and Arturo de Cordova as the French pirate.